Louis Pasteur (1822-1895) is probably one of the best known nineteenth-century scientists. He is considered the founder of microbiology. Perhaps his most important work was the discovery of food pasteurization (sterilization) and the development of vaccines. Pasteur was born in France and educated in Paris in the 1840s. He spent his career as a professor and researcher at several French universities. The main focus of his research was in organic (living) molecular structure and behavior. He was especially interested in fermentation, the process by which yeast transforms sugar into alcohol, as in the making of wine and beer, or the souring of milk and other perishable products. In the early nineteenth century there was no refrigeration to preserve delicate foods like milk and meat, so they spoiled quickly. No one really understood how and why. In the course of his investigations into the function of yeast, Pasteur decided that some out-side substances were taking over the natural fermentation process and ruining the product. He called these substances germs, and concluded that they were also involved in causing diseases by interfering with the body's biological processes in the same way as they interfered with yeast's biological activities. These germ microorganisms were originally thought to appear out of nothing when milk or meat spoiled, so there seemed no way to get rid of them. Pasteur proved through many experiments that germs always came from other germs. If all the germs in a given product could be killed, and the product protected from future invasion, it would not spoil. Pasteur used heat to kill the germ microbes. The process he used, called "pasteurization," was named for him. It is still used to purify and protect perishable products such as milk. Pasteur was not satisfied with this achievement. In the 1860s and 1970s, using his new germ theory, he discovered a parasite that was attacking silk worms. Pasteur also found the bacterium that caused anthrax (a disease that usually attacks domestic animals like cattle, but can also harm humans). He discovered that these germs could live in dead animal tissues and move through the air as spores (a small, single-cell reproductive organ often found in plants). By properly sterilizing areas of infection, Pasteur showed how diseases could be stopped. Other researchers, such as the surgeon Joseph Lister (1827-1912), applied Pasteur's antiseptic techniques to operating room patients and greatly increased their survival rates. 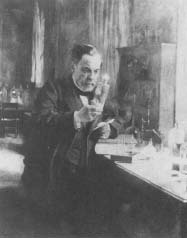 The science of immunization (vaccinating people and animals with weakened forms of a disease to provide immunity against the full form), also originated with Pasteur. He noticed that chickens that had been infected with an old, weakened versions of chicken cholera were immune to fresh cultures of the germs. Pasteur tried vaccinating cows with a weakened form of the anthrax bacterium, and found that they became immune to the disease. Another scientist named Edward Jenner (1749-1823) had experimented with injecting humans with the cowpox germ in order to make them immune to smallpox, a serious disfiguring disease. In honor of Jenner's achievement, Pasteur proposed that the weakened cultures used for immunizing be called "vaccines," from the Latin word "vacca," meaning " 'cow." Having worked on bacterial diseases, Pasteur then attacked the problem of rabies, a fatal disease often passed to humans by infected dogs (as well as other animals). In 1882, he discovered that rabies was caused by a very small germ, smaller than bacteria. Pasteur then developed a vaccine for rabies that worked both for animals and for humans. Louis Pasteur became so famous that money poured into the institute named after him. He continued his work at the Pasteur Institute for the rest of his life. Thanks to Pasteur, we now understand how infectious diseases are spread, and through vaccinations, doctors have been able to save countless human lives in the twentieth century. Louis Paster will always be remembered in the history chemistry and the germ theory. Oh what a legend. How and why did Pasteur sterilize his mixtures in glassware?